Designated Survivor is an American political drama television series created by David Guggenheim. 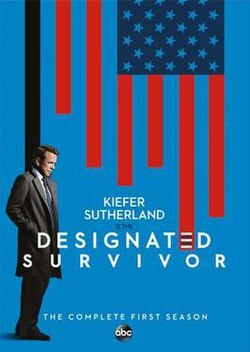 Kiefer Sutherland stars as Thomas Kirkman, an American politician named the designated survivor for the State of the Union address, who suddenly ascends from the Secretary of Housing and Urban Development to the position of President after an explosion kills everyone ranked ahead of him in the line of succession. Kirkman deals with his inexperience as President while looking to uncover the truth behind the attack. Kiefer Sutherland is always fun to watch, and in this series he is playing a rather lame middle-management type of politician forced into the limelight. Right from the start you can see the grain of Jack Bauer forming and almost predict his change to a dominant politician. It starts as captivating television. The only misstep are the obvious baddies – a power hungry senator who gets the police to enforce anti Muslim practices leading to the death of a boy. And the hot-headed hear of the armed forces. Any if you are going to con a senator and get your way, don’t immediately tell everyone your secret, it’s going to come back and bite you !.